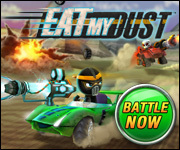 Eat My Dust is a 3D virtual world for adrenaline junkies with a love for healthy competition. In the world of Eat My Dust, you build your very own high-speed racing machine—weapons included. Custom parts range anywhere from massive swamp tires to supped up jet engines or even deadly dragon wings. Once in your car, you race against other online players by maneuvering your way through unique racing worlds and strategically using offensive and defensive power ups. By combining these two, EMD provides a diverse and action-packed racing experience that’s unmatched by any other racing world. Those with the skills to finish first get the top rewards and earn Coins and Street Cred. You can use Coins to buy gear that increases your car’s performance and appearance. You can also acquire these upgrades with Turbo Bucks. Turbo Bucks can be purchased on the website or earned in game over time. Above all else, Eat My Dust is a racing game jam packed full of fun competition where you can challenge friends and play in an exciting yet safe community full of people who love racing as much as we do. Be sure to check back regularly for exclusive sneak peeks, the latest news, and behind-the-scenes previews of Eat My Dust’s coolest features! 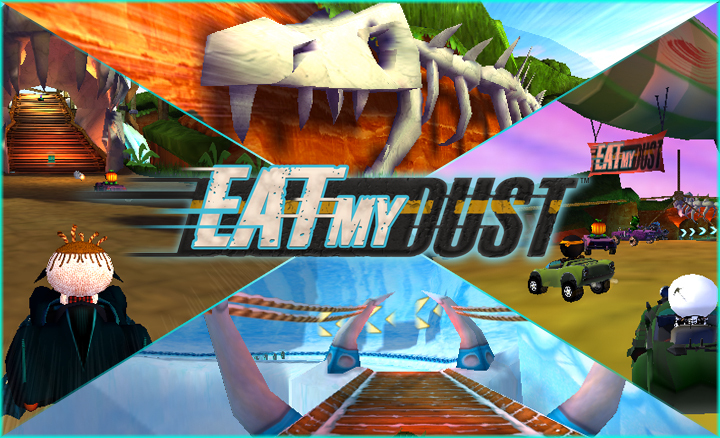 Get your racing helmets ready, Eat My Dust will be launching soon!